You'll be £8.00 closer to your next £10.00 credit when you purchase Apache over Libya. What's this? A few days later the Author and his fellow Apache pilots were in action at night over hostile territory. Within the range of Gaddafi’s capable air defence systems and land forces once in sight of the coast, they had to fight their way into Libya, complete their mission evading lethal ground fire, before the hazardous return to Ocean. Despite Libya’s state-of-the-art arsenal of ground-to-air weapons, the Apaches made nightly raids at ultra low-level behind enemy lines. 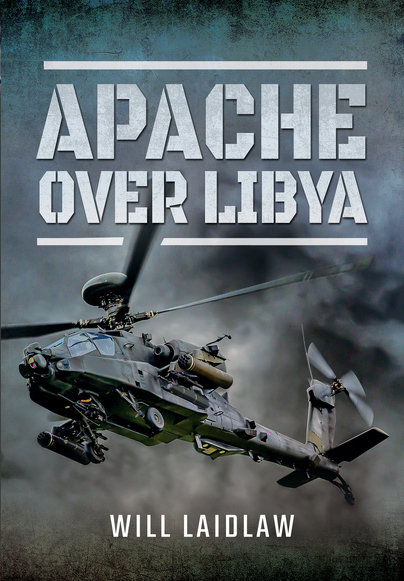 Apache Over Libya describes the experiences of eight Army and two Royal Navy pilots who played a significant role in the NATO led campaign. Despite fighting the best armed enemy British aircrew have faced in generations, they defied the odds and survived. Thrilling first hand action accounts vividly convey what it means to fly the Apache in combat at sea and over enemy-held terrain. An unforgettable and unique account which gives a rare insight into attack helicopter operations in war. A very good way to follow the operations of NATO in the closest combat, inside the cockpit of this formidable helicopter. This is a very well written account that really does put the reader in the cockpit of an Apache in the hostile skies over Libya - Excellent read. This fascinating book tells an important story; the author is an Army Air Corps pilot who was the commanding officer of 656 Squadron which was embarked in HMS Ocean during 2011. At the stroke of a politician's pen the UK had just lost the aircraft carriers Ark Royal and the RN strike wing of Harriers that was trained to operate from her. However, within weeks the British Government joined an international coalition that supported forces opposed to the Gaddafi regime in Libya. Other nation positioned aircraft carriers to strike from the sea but Ark Royal and her Harriers had already gone; The Italian Navy and US Marine Corps used Harriers very successfully but, fortunately, Ocean wars in the Mediterranean with Army Apaches and RN ASaC Sea Kings embarked for an exercise. The former were used to strike at targets deep in Libya, often against very sophisticated air defence systems. The book is based on the combined recollections of the author and the men and women under his command who kept note-books and diaries at the time. Laidlaw writes with clarity in a very readable style and his account of these operations is important for two reasons. First it gives those interested in these operations an excellent account of what happened from a senior pilot's perspective. Secondly, and as important, it describes operations that were the precursor of the joint tailored air groups envisaged for deployment in the Queen Elizabeth class aircraft carriers after 2020. He describes how his team, which included 2 RN pilots on loan to the Army Air Corps, was gathered together and trained for embarked operations. Successive chapters describe in detail individual strike operations and raids and it ends with reflections and an overview. There are end-notes, maps and a glossary but my only criticism is that the book lacks an index. Despite that I that I thoroughly recommend it as the most important work yet to appear on this important subject. offers a profoundly unromantic view of war: one of the long stretches of exhausting work and preparation, fraught with moments of intense, high-risk combat... an engaging account of the Libyan intervention that provides a firsthand perspective of aerial warfare, as well as a view of the challenges overcome along the way. Laidlaw’s book, a significant contribution towards the literature on Apache operations and NATO’s Libyan campaign, is the most compelling memoir of the war published to date. After the Bell UH-1D ‘Huey’, my favourite, The Apache is probably the most distinct ‘army’ helicopter in the world. We see them quite often in news flashes and magazines. But reading about their actual combat use is rare. So Will Laidlaw’s book most certainly fills a gap here. This is the story of a British pilot who wanted to prove the capability of the Apache being flown from Navy ships instead of from ground bases. When he finally gets his way and they head out to an exercise and ‘proof of concept’ training mission in the Mediterranean, they soon find themselves in the midst of the armed conflict in Libya, where the NATO starts an air campaign to support Gaddafi's opposition in the local civil war. What follows is the account of many hair raising missions over Libyan territory, behind enemy lines, mostly at night…. It is extremely interesting to read how the pilots trained, how they prepared their missions and how they managed to beat Gaddafi's considerable - Russian - air defenses AND inflicted heavy losses on the enemy, thus being instrumental in the progress of the ground war. Not only are the missions described in much detail, taking the reader along in the cockpit over the dark desert with missiles streaking over and underneath, the book also has quite a number of good maps showing where the action took place and it has a centre section with many photographs. This was so different from WW2 aerial fighting. Flying at treetop level, facing adversaries driving Toyota pickups with anti-aircraft guns and shoulder fired AA weapons. Not to mention the much more advanced Soviet AA missiles that Gaddafi also had… and used. Also very much worth notable is that the proceeds of this book will go to two British military charities, the Combat Stress and the SSAFA! There are a lot of very good books out there – but few would be as good as this. To tell the truth, I’ve been putting off writing my review of it, out of fear that I wouldn’t do it justice. Want to read more? Click here to read the rest. A great read. Factual, exciting and gritty. I hope this inspires the next generation of pilots, engineers and ground crew. I couldn't put this book down! A 100% true account of events, no tinsel and shiny bits...just the truth! Got this book three days ago and can't put it down. I was there in a ship so remember the events vividly, the author has hit the right tone and resisted sensationalist writing. Very recommended to those who are military history enthusiasts and those who are interested in the stories behind the headlines. Superb book. An excellent account of the Apache operations in Libya. Mr Laidlaw highlights the skill and dedication of everyone who plays a part in getting the Apache into the air and safely home. Very highly recommended. Very enjoyable read that frequently had me engrossed for far longer than I intended. Really takes you into the scene and just how innovative and dangerous these sorties were. I must say from the start I am a biased reader. My son was his pilot during this conflict and firstly I would like to thank him for his dedication and professionalism in conducting the operations over Libya which culminated in him bringing home not only my son but his entire squadron. well done and thanks. That out of the way this is an extremely well written book by a the men who participated in the war over Libya. It describes honestly the build up, execution of the war and its aftermath in great detail. The Apache, not being designed as a maritime weapon performed extremely well throughout this and the hazards and dangers it faced are well documented. It took me only three nights of bedtime reading to complete the volume being privileged to get an advance copy from my son. This did not prevent me from buying my own copy and I would recommend it to any supporter of the British Armed forces as you will learn a lot from it. Afghanistan aside, this is the first time this helicopter has been employed in the combat role it was designed for and it proved its reliability and capability in the role, even more surprising when it launched and recovered at sea. Thanks will, a really good book... Please buy it and read it. This is the British Armed forces and especially the AAC at its best. Read and enjoy. This account is modern warfare under a microscope, a very personal and heartfelt story of the strains of combat and command, of planning, leadership, de-briefing, while at the same time coping with some long-handled screwdriving from London and the penny-wise, pound-foolish, parsimonious attitude of Whitehall. The text is supported by an excellent selection of photographs. I thoroughly recommend this book and would urge the reader to dwell on the author’s comments on pages 166-7 and 169. An outstanding account from Will Laidlaw on how effective, deadly and professional the Apache has become in the hands of the Army Air Corps. For those of you who, like me, flew with the regiment some time ago, the book is riveting and demonstrates how far the Air Corps has come. Will Laidlaw is a son of the Scottish Borders and was educated in Scotland. He was commissioned into the Army Air Corps in the late 1990s and has amassed 1800 hours flying a range of military helicopters including the Apache. His work has taken him all round the world and he has deployed on active service in Iraq, Afghanistan and Libya.